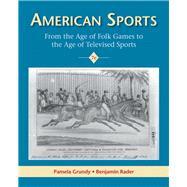 American Sports offers a reflective, analytical history of American sports from the colonial era to the present. Readers will focus on the diverse relationships between sports and class, gender, race, ethnicity, religion and region, and understand how these interactions can bind diverse groups together. By considering the economic, social and cultural factors that have surrounded competitive sports, readers will understand how sports have reinforced or challenged the values and behaviors of society. A comprehensive revision to the 7th edition preserves the detailed coverage of sports history while incorporating recent scholarship and expanded treatment of the challenges and dilemmas of twenty-first century sports. Greater attention is given to the sporting activities of women, African Americans, Latinos and Native Americans. Pamela Grundy is an independent historian who lives in Charlotte, North Carolina, where she pursues a variety of writing, teaching and museum projects. Her sports-related publications include Learning to Win: Sports, Education and Social Change in Twentieth-Century North Carolina, and Shattering the Glass: The Remarkable History of Women's Basketball (co-written with Susan Shackelford). Her work on sports has been published in the Journal of American History, the International Journal of the History of Sport and Southern Cultures, and has received awards from the American Historical Association, the North American Society for Sport History the History of Education Society and the Oral History Association. Benjamin G. Rader is James L. Sellers Professor of History, Emeritus, University of Nebraska-Lincoln. He has authored eight books, including Baseball: A History of American Game, 3rd. ed. (2008) and has had articles appear in the Journal of American History, American Quarterly, the Journal of Sport History, and the Journal of Popular Culture. Presently, he is completing a book tentatively entitled Down in the Hollows: A Tale of Neighborhood and Family in the Missouri Ozarks. Married with one adult child and three grandchildren, he continues to be an avid tennis player. Who Should Be a Mascot?